The English 2013 One Pound Coin. Three versions of the one pound coins were released in 2013. The reverse shows a floral emblem (Oak and rose) representing England. The design is by Timothy Noad. 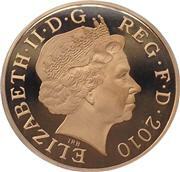 The 2013 One Pound Coin - Rose and Oak (a British one pound (£1) coin) is a denomination of the pound sterling. Its obverse bears the Latin engraving "Dei Gratia Regina" meaning, "By the grace of God, Queen" and FD meaning "Defender of the Faith."